Most children’s step stools range from 13cm to 17cm high. The Up Step is 21 cm high. 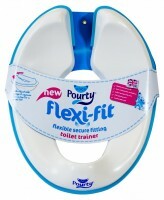 As children are potty training later, they are able to step on to higher step stools. Higher step stools make it easier for the child to get onto the toilet or reach sink or counter and recent research shows that it easier for a child to pee or poo on the toilet when their feet are supported. The Up Step offers that support. Also, the Up Step is sturdy, stable and strong, supporting the weight of an adult weighing up to 80Kg. It incorporates a non-slip top and base for safety. 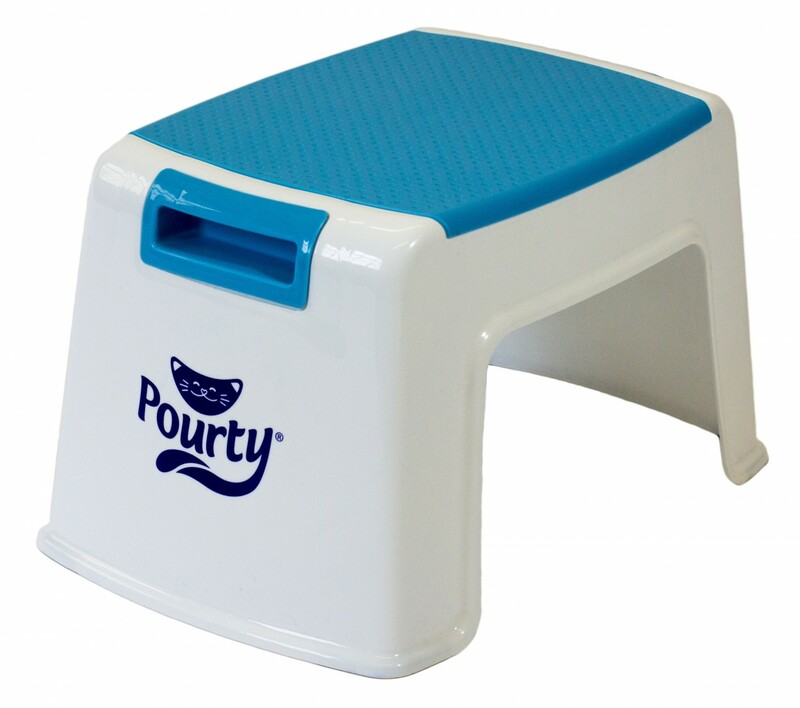 The Up Step completes the Pourty Toilet Training Product Range and co-ordinates with the Flexi-fit Toilet Trainer and the Pourty Easy to Pour potties in blue and white. UK postage and packing costs a flat fee of £2.95 (by First Class Royal Mail). If you wish to order from outside mainland UK, please contact us and we will let you know the delivery costs. International orders will be sent by standard Royal Mail airmail. 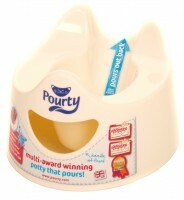 This page (together with the documents referred to on it) tells you the terms and conditions on which we supply any of the products (Products) listed on our website www.pourty.co.uk (our site) to you. Please read these terms and conditions carefully before ordering any Products from our site. You should understand that by ordering any of our Products, you agree to be bound by these terms and conditions. You should print a copy of these terms and conditions for future reference. 1. Information about us We operate the website www.pourty.co.uk. We are Pourty International Limited, a company registered in England and Wales under company number 07071873 and with our registered office at Forthay, Forthay, Dursley, Gloucestershire GL11 6EA. Our VAT number is 980911406. 2. Region We are only able to accept orders from individuals in the United Kingdom. If you are ordering from outside the United Kingdom, please contact us. 3. How the contract is formed between you and us 3.1 After placing an order, you will receive an e-mail from us acknowledging that we have received your order. Please note that this does not mean that your order has been accepted. Your order constitutes an offer to us to buy a Product. All orders are subject to acceptance by us, and we will confirm such acceptance to you by sending you an e-mail that confirms that the Product has been dispatched (Dispatch Confirmation). The contract between us (Contract) will only be formed when we send you the Dispatch Confirmation. 3.2 The Contract will relate only to those Products whose dispatch we have confirmed in the Dispatch Confirmation. We will not be obliged to supply any other Products which may have been part of your order until the dispatch of such Products has been confirmed in a separate Dispatch Confirmation. 4. Consumer rights 4.1 If you are contracting as a consumer, you may cancel a Contract at any time within seven working days, beginning on the day after you received the Products. In this case, you will receive a full refund of the price paid for the Products in accordance with our refunds policy (set out in clause 10 below). 4.2 To cancel a Contract, you must inform us in writing. You must also return the Products to us as soon as reasonably practicable, and at your own cost. You have a legal obligation to take reasonable care of the Products while they are in your possession. If you fail to comply with this obligation, we may have a right of action against you for compensation. 5. Availability and delivery Your order will be fulfilled by the delivery date set out in the Dispatch Confirmation or, if no delivery date is specified, then within a reasonable time of the date of the Dispatch Confirmation, unless there are exceptional circumstances. 6. Risk and title 6.1 The Products will be at your risk from the time of delivery. 6.2 Ownership of the Products will only pass to you when we receive full payment of all sums due in respect of the Products, including delivery charges. 7. Price and payment 7.1 The price of the Products and our delivery charges will be as quoted on our site from time to time, except in cases of obvious error. 7.2 Product prices include VAT. 7.3 Product prices and delivery charges are liable to change at any time, but changes will not affect orders in respect of which we have already sent you a Dispatch Confirmation. 7.4 It is always possible that, despite our best efforts, some of the Products listed on our site may be incorrectly priced. We will normally verify prices as part of our dispatch procedures so that, where a Product's correct price is less than our stated price, we will charge the lower amount when dispatching the Product to you. If a Product’s correct price is higher than the price stated on our site, we will normally, at our discretion, either contact you for instructions before dispatching the Product, or reject your order and notify you of such rejection. 7.5 We are under no obligation to provide the Product to you at the incorrect (lower) price, even after we have sent you a Dispatch Confirmation, if the pricing error is obvious and unmistakeable and could have reasonably been recognised by you as an error. 7.6 Payment for all Products must be by credit or debit card. We will not charge your credit or debit card until we dispatch your order. 8. Our refunds policy 8.1 If you return a Product to us: (a) because you have cancelled the Contract between us within the seven-day cooling-off period (see clause 4.1 above), we will process the refund due to you as soon as possible and, in any case, within 30 days of the day you gave notice of cancellation. In this case, we will refund the price of the Product in full, and any applicable delivery charges. However, you will be responsible for the cost of returning the item to us. (b) for any other reason, we will examine the returned Product and will notify you of your refund via e-mail within a reasonable period of time. We will usually process the refund due to you as soon as possible and, in any case, within 30 days of the day we confirmed to you via e-mail that you were entitled to a refund. We will refund the price of a defective Product in full, any applicable delivery charges and any reasonable costs you incur in returning the item to us. 8.2 We will usually refund any money received from you using the same method originally used by you to pay for your purchase. 9. Warranty We warrant to you that any Product purchased from us through our site will, on delivery and for the following 12 months, conform in all material respects with its description, be of satisfactory quality, and be reasonably fit for all the purposes for which products of that kind are commonly supplied. 10. Our liability 10.1 Subject to clause 10.3, if we fail to comply with these terms and conditions, we shall only be liable to you for the purchase price of the Products and, subject to clause 10.2, any losses that you suffer as a result of our failure to comply (whether arising in contract, tort (including negligence), breach of statutory duty or otherwise) which are a foreseeable consequence of such failure. 10.2 Subject to clause 10.3, we will not be liable for losses that result from our failure to comply with these terms and conditions that fall into the following categories even if such losses result from our deliberate breach: (a) loss of income or revenue; (b) loss of business; (c) loss of profits; (d)loss of anticipated savings; (e) loss of data; or (f) waste of management or office time. However, this clause 10.2 will not prevent claims for loss of or damage to your tangible property that are foreseeable or any other claims for direct loss that are not excluded by categories (a) to (f) inclusive of this clause 10.2. 10.3 Nothing in this agreement excludes or limits our liability for: (a) death or personal injury caused by our negligence; (b) fraud or fraudulent misrepresentation; (c) any breach of the obligations implied by section 12 of the Sale of Goods Act 1979; defective products under the Consumer Protection Act 1987; or (d) any other matter for which it would be illegal for us to exclude or attempt to exclude our liability. 11. Import duty 11.1 If you order Products from our site for delivery outside the UK and we agree to acepot such order, they may be subject to import duties and taxes which are levied when the delivery reaches the specified destination. You will be responsible for payment of any such import duties and taxes. Please note that we have no control over these charges and cannot predict their amount. Please contact your local customs office for further information before placing your order. 11.2 Please also note that you must comply with all applicable laws and regulations of the country for which the products are destined. We will not be liable for any breach by you of any such laws. 12. Written communications Applicable laws require that some of the information or communications we send to you should be in writing. When using our site, you accept that communication with us will be mainly electronic. We will contact you by e-mail or provide you with information by posting notices on our website. For contractual purposes, you agree to this electronic means of communication and you acknowledge that all contracts, notices, information and other communications that we provide to you electronically comply with any legal requirement that such communications be in writing. This condition does not affect your statutory rights. 13. Notices All notices given by you to us must be given to Pourty International Limited at info@pourty.com. We may give notice to you at either the e-mail or postal address you provide to us when placing an order, or in any of the ways specified in clause 12 above. Notice will be deemed received and properly served immediately when posted on our website, 24 hours after an e-mail is sent, or three days after the date of posting of any letter. In proving the service of any notice, it will be sufficient to prove, in the case of a letter, that such letter was properly addressed, stamped and placed in the post and, in the case of an e-mail, that such e-mail was sent to the specified e-mail address of the addressee. 14. Transfer of rights and obligations 14.1 The contract between you and us is binding on you and us and on our respective successors and assignees. 14.2 You may not transfer, assign, charge or otherwise dispose of a Contract, or any of your rights or obligations arising under it, without our prior written consent. 14.3 We may transfer, assign, charge, sub-contract or otherwise dispose of a Contract, or any of our rights or obligations arising under it, at any time during the term of the Contract. 15. Events outside our control 15.1 We will not be liable or responsible for any failure to perform, or delay in performance of, any of our obligations under a Contract that is caused by events outside our reasonable control (Force Majeure Event). 15.2 A Force Majeure Event includes any act, event, non-happening, omission or accident beyond our reasonable control and includes in particular (without limitation) the following: (a) strikes, lock-outs or other industrial action; (b) civil commotion, riot, invasion, terrorist attack or threat of terrorist attack, war (whether declared or not) or threat or preparation for war; (c) fire, explosion, storm, flood, earthquake, subsidence, epidemic or other natural disaster; (d) impossibility of the use of railways, shipping, aircraft, motor transport or other means of public or private transport; (e) impossibility of the use of public or private telecommunications networks; and (f) the acts, decrees, legislation, regulations or restrictions of any government. 15.3 Our performance under any Contract is deemed to be suspended for the period that the Force Majeure Event continues, and we will have an extension of time for performance for the duration of that period. We will use our reasonable endeavours to bring the Force Majeure Event to a close or to find a solution by which our obligations under the Contract may be performed despite the Force Majeure Event. 16. Severability If any of these terms and Conditions or any provisions of a Contract are determined by any competent authority to be invalid, unlawful or unenforceable to any extent, such term, condition or provision will to that extent be severed from the remaining terms, conditions and provisions which will continue to be valid to the fullest extent permitted by law. 17. Entire agreement 17.1 These terms and conditions and any document expressly referred to in them constitute the whole agreement between us and supersede all previous discussions, correspondence, negotiations, previous arrangement, understanding or agreement between us relating to the subject matter of any Contract. 17.2 We each acknowledge that, in entering into a Contract, neither of us relies on, or will have any remedies in respect of, any representation or warranty (whether made innocently or negligently) that is not set out in these terms and conditions or the documents referred to in them. 17.3 Each of us agrees that our only liability in respect of those representations and warranties that are set out in this agreement (whether made innocently or negligently) will be for breach of contract. 17.4 Nothing in this clause limits or excludes any liability for fraud. 18. Law and jurisdiction 18.1 Contracts for the purchase of Products through our site and any dispute or claim arising out of or in connection with them or their subject matter or formation (including non-contractual disputes or claims) will be governed by English law. Any dispute or claim arising out of or in connection with such Contracts or their formation (including non-contractual disputes or claims) will be subject to the non-exclusive jurisdiction of the courts of England and Wales. Our refunds policy If you return a Product to us: (a) because you have cancelled the Contract between us within the seven-day cooling-off period (see clause 4.1 of our terms and conditions), we will process the refund due to you as soon as possible and, in any case, within 30 days of the day you gave notice of cancellation. In this case, we will refund the price of the Product in full, and any applicable delivery charges. However, you will be responsible for the cost of returning the item to us. (b) for any other reason, we will examine the returned Product and will notify you of your refund via e-mail within a reasonable period of time. We will usually process the refund due to you as soon as possible and, in any case, within 30 days of the day we confirmed to you via e-mail that you were entitled to a refund. We will refund the price of a defective Product in full, any applicable delivery charges and any reasonable costs you incur in returning the item to us. We will usually refund any money received from you using the same method originally used by you to pay for your purchase.